Potato latkes are delicious at any time of the year, but this traditional Jewish food is slightly problematic during Passover. Latkes are typically made with flour, but during this holiday—which commemorates the liberation of the Israelites from Egyptian slavery—all chametz is forbidden. That refers to anything made from wheat, barley, rye, oats, or spelt that has come into contact with water and been allowed to ferment and rise. Instead, these potato latkes are made with matzo meal, the flour of a crisp unleavened bread that's allowed during the holiday. The matzo meal provides a nice substitute for the flour and serves as the binding, along with the eggs, for the latkes. Using the grating disk of a food processor, shred the potatoes. Transfer the grated potatoes to another bowl. Do the same with the onions. Replace the grating disk with the metal blade and return the potatoes to the processor bowl along with onions, matzoh, eggs, salt, and pepper. Process until well-combined. Add more matzoh meal if the mixture is too runny. Heat about 1/4-inch oil in a large skillet until hot enough for a small drop of batter to sizzle when it touches the grease. Using a large spoon, mound equal portions of potato mixture in oil, flattening slightly. Shake pan to make sure pancakes aren't sticking. Fry the latkes over medium heat 5 to 8 minutes per side. If you don't have a food processor, use a box grater to shred the potatoes and onions. Although you can use any type of potato for the latkes, Idaho russet potatoes have a high starch content that brown the best during frying while maintaining a fluffy, soft interior. For the crispiest latkes, squeeze the potato shreds through a cheesecloth to remove excess water. 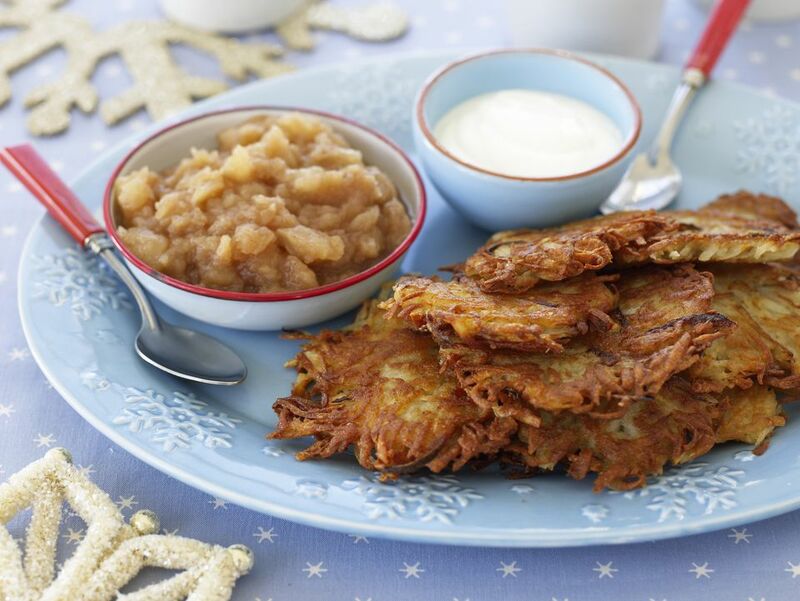 Serve the latkes hot with applesauce and sour cream, both of which are traditional pairings for these fried potato pancakes. Zucchini latkes: Add vegetables to your recipe by substituting five medium-sized zucchini, shredded, for the potatoes. To do half-and-half, replace half of the potatoes with the shreds of between two and three zucchini. Keep in mind that zucchini is full of water, so you should shred them, salt the shreds, and let it drain in a paper towel-lined colander for about an hour before starting the latke batter. Sweet potato latkes: Try something new by replacing white potatoes with the equivalent amount of sweet potatoes. For a slightly different flavor profile, add cinnamon and nutmeg to the batter. Cilantro-jalapeno latkes: Give the latkes a nontraditional Southwestern flavor by adding chopped jalapenos and cilantro to the batter.